Having difficulty finding the right Mac cleaner software? AweCleaner is one of the top leading software, providing you with top of the line functions and features to get rid of unnecessary, junk files. This Mac cleaner allows you to clean up all the unwanted files in just a one click. With this amazing Mac cleaning software, you can find and remove unwanted, duplicated files, uninstall useless applications, and manage startup items and disks. It’s more than just a cleaning software. It helps you find duplicated data on your Mac and delete unnecessary apps or software to free up some space. It’s the single source to keep all the unwanted stuff at bay. You can easily uninstall plug-ins, applications, widgets and other associated files with just one click. Large files cover a significant amount of storage space and can slow down your Mac. 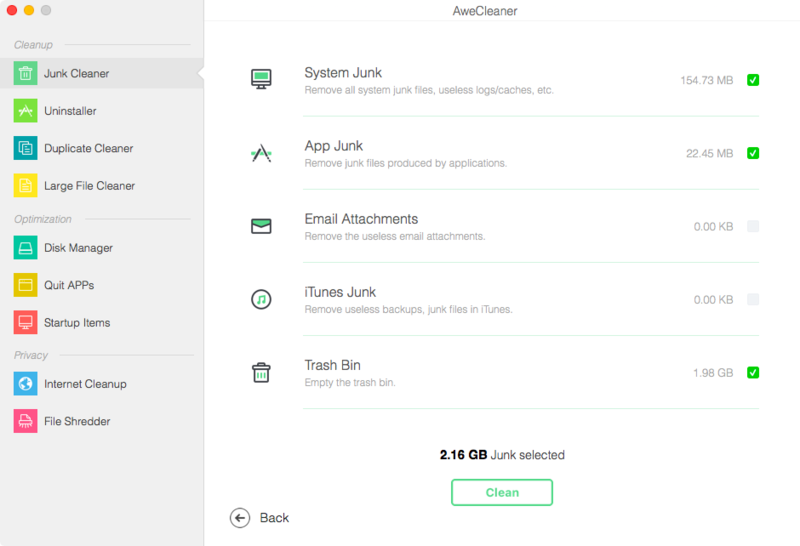 With AweCleaner, you can easily keep your Mac in a good, running condition. The key tools you get include Startup Optimzation, File Shredder, Internet Cleanup, Quit All APPs, Disk Manager and more. Overall, the AweCleaner is the best cleaning software from all aspects. How you look at AweCleaner? Have something to add to this story? Please feel free and don’t hesitate to let us know your valuable feedback, using the comment section below. We greatly appreciate your feedback and love hearing from our visitors.